The phrase “lifetime ban” just sounds harsh. It sounds stern, sounds eternal. Unless, of course, said ban isn’t actually for a lifetime, but just for three years — less than the normal amount of time needed to earn a college degree. Jennry Mejia, who was given a lifetime ban from MLB just three years ago, was reinstated last year and Tuesday the Boston Red Sox have signed the right-handed pitcher to a minor-league contract. If Mejia pitches well, there’s a chance he could reach the major leagues again this season. Mejia, a 29-year-old Dominican, was banned on Feb. 12, 2016 as punishment for his third positive test for performance-enhancing drugs, the typical penalty according to the MLB and MLB Players Association’s Joint Drug Agreement. Players are allowed to apply for reinstatement after a minimum of two years, subject to the commissioner’s discretion. Commissioner Rob Manfred approved Mejia’s reinstatement for the 2019 season on July 6 of last year. MLB’s penalties for players who test positive for PEDs are widely considered to be the toughest in sports. But that consideration is based on the lifetime ban for the third offense, not a ban that is only three years in actuality. The fact MLB would allow Mejia — or any three-time offender — back into their sport is appalling. This is a man who knowingly took the banned substances stanozolol and Boldenone in an intentional effort to cheat his way to success. All three of his positive tests were within one year; the failed tests were announced April 11 and July 28 of 2015 and Feb. 12, 2016. Here’s how blatant Mejia’s PED use was: after his 80-game suspension for his first failed test, he only pitched seven games before he was busted a second time. And his third failed drug test, the one resulting in the “lifetime ban,” came before his 162-game suspension for the second had expired. Why would MLB want this phony back in their game? While Mejia appeared to be a good pitcher in his last full season in 2014, saving 28 games for the Mets with a 3.65 ERA, that success comes with the uncertainty of how much help he had from PEDs. If MLB were truly serious about keeping their game as clean as possible, they wouldn’t even have read Mejia’s application for reinstatement, much less granted his return to the game. Instead, the league showed a concerning nonchalance by allowing Mejia to pitch. There’s no good reason MLB should want Mejia playing. Sure, he’ll be subject to six urine tests and three blood tests per year on top of the league’s random drug tests required of every player. But the point of the penalties is to serve as a deterrent to people committing the acts in the first place. It’s the same reason those convicted of a crime are sent to prison. Yet that deterrent is lessened when the penalty on the third offense proves to not be a lifetime ban, but instead a three-year ban. A 25-year-old — like Mejia in 2015 — having their career ended for a third positive test is far more blunt (and appropriate) a penalty than allowing the player to come back at 28, still in their physical prime. MLB says they’re doing everything they can to keep PEDs out of baseball. But actions speak louder than words. Friday night marked the annual induction ceremony for the Atlanta Braves Hall of Fame as part of the team’s ChopFest Gala. Terry Pendleton was among the two inductees, alongside 19th-century star Hugh Duffy. “T.P.” played five seasons for the Braves and was a key member of the National League championship teams of 1991 and 1992, winning a batting title and NL MVP in 1991 after signing with the team the previous offseason. Pendleton was a clubhouse leader and teammates credited him with helping to change the team culture as the team was transformed from their 1980’s mediocrity into the perennial winners of the 1990s. Chipper Jones credits the mentoring of Pendleton for helping him learn how to handle himself as a major leaguer. His leadership has continued after his playing career, both in coaching and front-office roles. Pendleton’s induction has been long overdue, and begs the question what other former Braves are worthy of induction next year and beyond. Simply put, Leo Mazzone is one of the greatest pitching coaches of all-time. 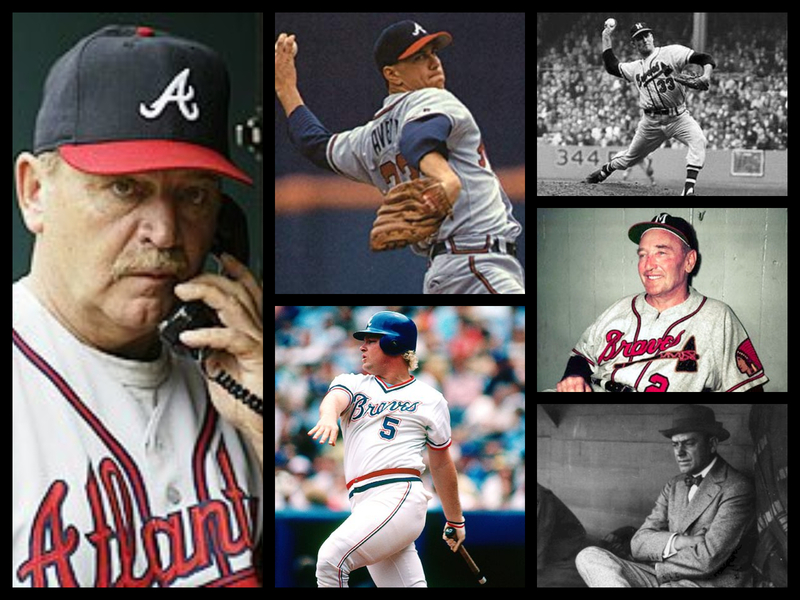 Mazzone served as Braves pitching coach from 1990-2005 under manager Bobby Cox, presiding over the legendary pitching staffs of the 1990s led by Greg Maddux, Tom Glavine, John Smoltz and Steve Avery. Braves pitchers won the Cy Young Award six times between 1991-98. In a statistical analysis, author J.C. Bradbury found that pitchers had a better ERA under Mazzone by 0.64 points than under other pitching coaches, and that pitchers’ ERAs went up by 0.78 points in the season after leaving Mazzone. It’s a no-brainer that Mazzone should be in the Braves Hall of Fame — and he has a case for consideration to the National Baseball Hall of Fame in Cooperstown. As important as the “Big Three” of Maddux, Glavine and Smoltz were to the Braves successes of the 1990s, Steve Avery played just as big a role. Avery pitched seven seasons for the Braves and had a 3.83 ERA with the team, including a 3.17 mark from 1991-93. He pitched to a 2.90 ERA in 18 postseason games, was the 1991 NLCS MVP after pitching 16 1/3 scoreless innings in the series and won Game 4 of the Braves’ victorious 1995 World Series. Horner played both corner-infield positions for the Braves from 1978-86 and was a key member of the 1982 NL West Division championship team. The Braves drafted Horner out of Arizona State in 1978 and he became a rare player to debut professionally in the major leagues without playing a game in the minors. In that debut, he homered off Hall of Fame pitcher Burt Blyleven. He won Rookie of the Year after hitting 23 homers in 89 games. In nine seasons with the Braves, Horner slashed .278/.339/.508 with 215 homers and 652 RBIs. He had three seasons of 32 or more homers and two seasons of 97 or more RBIs. Horner also became one of 18 players in MLB history (and one of three Braves) to hit four homers in one game, doing it on July 6, 1986. Fred Haney and George Stallings are each worthy of induction to the Braves Hall of Fame after each guided the franchise to one of its three World Series championships. Despite unsuccessful managerial stints with the St. Louis Browns and Pittsburgh Pirates, Haney took over the Braves managerial job midway through the 1956 season after the firing of Charlie Grimm and led them to a 68-40 record the rest of the way. The following season Haney led the Braves to a 95-59 record and won the World Series in seven games over the Yankees. For an encore performance, Haney’s team was 92-62 in 1958 and returned to the World Series, only to lose to the Yankees. Haney was dismissed following the 1959 season after the Braves lost a NL Pennant tiebreaker series to the Dodgers. Haney, with a 341-231 record, has the second-best managerial winning percentage (.596) in franchise history (min. two seasons). Stallings managed the “Miracle Braves” in 1914, leading them to the World Series title. The team started 4-18 and was 26-40 on July 4 before going 66-19 the rest of the way to win the pennant and sweeping the Philadelphia Athletics in the World Series. Stallings, a Georgia native, managed the Boston Braves from 1913 to 1920, and while the 1914 championship team was his only playoff appearance with the club, he also led the team to solid records in 1915-16 (and it was much harder then to make the postseason). Stallings’ 579 wins are the third most by a manager in franchise history. On May 20, 2010, the Atlanta Braves overcame a 9-3 deficit in the ninth inning to beat the Cincinnati Reds 10-9, an incredible comeback capped by a pinch-hit, walk-off grand slam by journeyman backup infielder Brooks Conrad. Sunday, eight years to the day after Conrad’s memorable hit, the 2018 edition of the Braves came back in similar fashion, using a six-run ninth inning to beat the Miami Marlins, by an identical score of 10-9. This comeback was just as amazing as the one eight years earlier, if not more so; this one came without the benefit of a single extra-base hit, as the Braves methodically chopped away at the Marlins lead — down to their last strike 10 times — before finally winning on a bullet down the left-field line by Dansby Swanson. Swanson’s turn as the hero was nearly as unlikely as Conrad’s — it was Swanson’s first hit since missing 15 games with a wrist injury. But while the comeback was incredible, some of the comments made by the team afterward were perhaps even more telling about the makeup of this Braves team. After rebuilding seasons of 95, 93 and 90 losses the last three years, the Braves are back — they sit at 29-18, holding the best record in the National League and a 1 1/2 game lead in the NL East. Atlanta, the state of Georgia and the whole southeast (“Braves Country”) has a team to be excited about again. I wasn’t around for the “worst-to-first” season of 1991, in which the Braves reached the World Series — their first since moving to Atlanta — after three straight last-place finishes in their division. I’ve always wondered how thrilling that experience must have been like for the Braves and their fans. Perhaps this season is providing a taste of that — and hopefully, like 1991, the thrills will continue all the way into October. Going back to those rodeos, the Braves are sitting on a bull named “First Place,” something very few expected when the season began eight weeks ago. It’s still early — if the 162-game schedule is the fabled “eight-second ride,” we’re a little over two seconds in. Some say the Braves, as young as they are, are sure to fall off the bull before the eight seconds is up. But given their knack for comebacks, their will and determination, and what appears from a distance to be a great team chemistry, I like their chances. That bull is sure to try and throw the Braves off — every team goes through plenty of adversity over the course of 162 games that, if they’re not ready for it, can throw them — but I have a feeling that when the eight seconds is up, the Braves could very well be the last ones standing and advance into the goat roping known as the postseason. Ronald Acuña, the Atlanta Braves outfield prospect who is the top-ranked prospect in all of baseball according to Baseball America, has been the talk of Braves spring training since the beginning of camp, tearing up the Grapefruit League and showing why there’s so much hype around him. But on Monday, new Braves general manager Alex Anthopoulos reassigned Acuña to minor-league camp, meaning he will start the season in the minors at AAA Gwinnett — and it’s a good decision by the Braves front office. Why is it the right move for the Braves to send to the minors a player who is playing as well as anyone this spring and has proven he is ready for the major leagues? Because given the current MLB rules regarding service time and arbitration, this will actually benefit the team long-term. In the current collective bargaining rules between the MLB and the MLB Players Association, a full season of service time is 172 days, even though the MLB’s regular season is 186 days long. As a result, even if Acuña (or anyone else) plays in the majors for 171 days in 2018, it does not count as a full year of service time and the Braves will have an extra year of contractual control in his arbitration years. If Acuña is not called up to the major leagues before April 13, he will be a free agent after the 2024 season; were he on the Opening Day roster, he would be a free agent after 2023. Given the opportunity to keep a player of Acuña’s talent an additional year in the prime of his career, at only the expense of two weeks out of his rookie season, why wouldn’t the Braves keep him at Gwinnett for those two weeks? Put another way, 162 games of Acuña at age 26 is worth losing 12 games of his age-20 season. This is especially true for a club in the Braves position. The Braves’ rebuild, which began after the 2014 season and has been rooted in building a stellar farm system, has them positioned for sustained success in the coming years, but they are still likely a year away from legitimately contending, barring a surprise 2018. A .500 season is a fair goal this year; therefore, even if they lose a game in the first two weeks that they might have won with Acuña on the roster (which, by the way, there’s no way to definitively measure), that game will likely not cost them a division title or a spot in the postseason. This concept is not new in MLB — the Cubs did this in 2015 with Kris Bryant, who was called up on April 17 and proceeded to win Rookie of the Year in 2015 and MVP in 2016. Like Bryant three years ago, Acuña has had a terrific spring, hitting .432 with a .519 on-base percentage and a .727 slugging percentage, with four homers and 11 RBIs. The strong spring is an extension of his strong 2017 season across three levels of the minors, where he actually improved statistically at each level, totaling a .325 average with a .896 OPS. Acuña was also the MVP of the prospect-laden Arizona Fall League. Among those who have seen him play, there is little doubt Acuña is a legitimate five-tool talent with the ability to become a major league star. And while it would be nice for Braves fans, and for the game in general, if he were on the Braves’ Opening Day roster, to me his special talent level and potential further solidify that this is the right move. A small faction of Braves fans are frustrated at the team’s decision to keep their Acuña in the minors to start the season. But if this works out like most think it will — if he is, in fact, able to live up to the hype — those same fans will be thanking management when Acuña is still in left field at SunTrust Park on Opening Day 2024 for the World Series favorite Atlanta Braves. Forget the hypothetical of “what would it be like to run an MLB team” — this year I’m actually going to do it. All I need is a couple hundred million dollars and the cooperation of MLB to allow me to start an expansion team less than two months before Opening Day. With any luck, by the first week of November I’ll be lifting the Commissioner’s Trophy as a World Series champion. How am I going to do this, you ask? I’ll simply sign a team of current free agents, and that team will be so deep and talented that they’ll win it all this fall. Of course I’m kidding about starting a team, but the fact is, even just two weeks from Spring Training, the MLB free agent market has moved so slow this winter that there still remain enough quality free agents on the market that a hypothetical team of them could win the World Series. Every position has an All-Star-caliber player on the board, with all except catcher also featuring incredible depth on a hypothetical team. Having this many high-quality free agents available on Feb. 2 seems unprecedented (with the exception of the strike offseason of 1994-95), and due to the high volume of unsigned players, the MLB Players Association is considering running a Spring Training camp for these players to attend until they sign, and has even discussed a potential work stoppage in protest of the high number of unsigned players (more on that later). Looking closely at the current MLB landscape, there are reasons for this offseason’s historically-slow market. With the recent success of the Cubs and Astros, winning the last two World Series as the dividend of their massive rebuilding projects, more teams are following that model, going all-in on rebuilding — some would even call it tanking — trying to win later by building up the talent in their farm system at the expense of the current success of the major league club. Those comments are quite stern, and should be taken with at least a moderate grain of salt since Boras is always brash, and here is venting frustration that his players are not yet signed. But he may have actually been under-selling the number of teams opting not to compete in the free agent market — according to Jayson Stark, 13 of the 30 MLB teams have not signed a position player to a major-league contract this offseason. Another factor, and one less discussed than the number of teams rebuilding, is the absolutely loaded free agent class coming next winter (Bryce Harper, Josh Donaldson, Manny Machado, Charlie Blackmon, Dallas Keuchel and Craig Kimbrel are just the headliners, with many others also set to be free agents). With a historically-good group set to be free agents next winter, it is entirely possible that teams are consciously not spending money now to keep funds available to offer big contracts to major players this time next year. Unfortunately, these factors have combined to negatively impact the current free agents listed in the hypothetical team above and others, as it is February and they still don’t know where they will play in the 2018 season and beyond. The possibility of a work stoppage by the MLBPA has reportedly been discussed, although it’s unknown how realistic that possibility actually is. Such a move would certainly not be popular among fans (See: 1994 MLB strike), but certainly is not unprecedented — remember, the first time MLB and the MLBPA went through a round of collective bargaining negotiations without a work stoppage was not until 2002. So maybe that expansion team full of current free agents isn’t such a bad idea. If it prevents a work stoppage, and thus a black eye on baseball, it may be priceless.